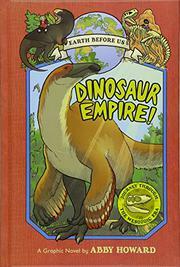 A quick trip through the Mesozoic Era with a paleontologist is all young Ronnie needs to become a dino-maniac. So desperate is Ronnie to better a dinosaur exam’s failing grade that she’s willing to follow her odd but scholarly neighbor Miss Lernin into a curbside recycling bin—which, thanks to “Science Magic,” leaves the two in the late Triassic. Between meeting plateosaurs on that stop and a cozy nuzzle with a T. rex in the late Cretaceous, Ronnie gets an earful about dinosaur anatomy, convergent evolution, types of prehistoric life, protofeathers and other recent discoveries, and (as Miss Lernin puts it) “the exciting world of…phylogenetic trees! !” But mostly what she gets are dinosaurs. The graphic panels teem with (labeled) prehistoric life including, along with dozens of dinos, many early mammals and other contemporaries. Howard depicts nearly all of this fauna with snub noses and such friendly expressions that in no time (so to speak) Ronnie is exclaiming “Oh my gosh…Jurassic crocodylomorphs were so cute!” Indeed, her white tutor agrees, but also cool, dangerous, and majestic. Ronnie, who is depicted as a black girl, returns to the present to earn a perfect score on a retaken test and go on to spread the dino-word to her diverse classmates. Though the lack of source or resource lists is disappointing, closing graphic recaps of major prehistoric creatures and, yes, a phylogenetic tree provide some review. THIS CHICKEN IS A T-REX!